Quan An Ngon located at 18 Phan Boi Chau and Hoang Dao Thuy Street 25T2. If you want to try a traditional Vietnamese meal in the restaurant which has a unique background, this place is the answer. The chefs cook at several locations are open, so visitors can see how they cook. In addition, the Hanoi Social Club Restaurant is located at 7 Hoi Vu, Hoan Kiem also suitable for vegetarians and Vegan. Do not forget to stop by Newday Restaurant is located at 72 Ma May which serves a varied menu of Vietnamese dishes. This restaurant is also one of the locals eating options. The food portions are large and the prices are quite cheap. Pho is the national dish of Vietnam in the form of rice flour noodles with clear broth. 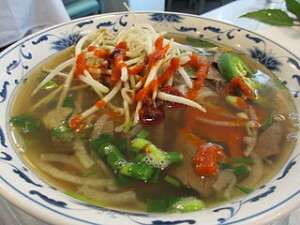 Usually the use of pho or beef pho bo, pho ga, or chicken, or pork. Pho in the restaurant you can enjoy even at home eating franchises such as Pho 24 and Pho 2000 which already has branches in Vietnam. However, tourists have not really have not felt in Vietnam when pho in food hawkers. Just as an illustration, a bowl of pho prices ranging between 20,000 and 30,000 Dong. Here are some pho stalls to try when you are on vacation to Hanoi. Pho Bo Gia Truyen located at 49 Bat Dan Street, not far from Hang Da Market. This stall is famous for beef and veal with a sauce of uric very clear. Pho Ly Quoc Su Bo is located at 77 Phung Hung Street, close to the junction between the Phung Hung and Hang Ma. This point serves pho from southern Vietnam, usually crowded at breakfast. Pho Thin located at 13 Lo Duc, near junction between Han Thuyen and Phan Chu Trinh in the south of Hoan Kiem Lake. This point presents a slightly different pho broth thick with darker colored. Bo Duong Pho Tau is located on Tran Phu 3, at the corner Tong Tan Tuy. These stalls open in the afternoon. Mai Anh Pho Ga is located at 34 Le Van Huu. This point has even been covered by The New York Times. Pho Ga is located at 53 Hang Ma. The stall is open from 06.00 to 22.00. The snails are boiled with herbs lemongrass, ginger and lime leaves are a common snack in Vietnam. You can order a small or large bowl, and choose a type of snail anything they want. They will give the boiled snails with sauce bowl and iron rods being used to take the snail meat. Usually sauce made of water mixed with fish sauce, sugar, vinegar, and lime juice. Some street food stalls that sell various types such as Nong Ha Trang Oc is located in the central part of the area to Hoan Kiem Dinh Liet precisely in 1A near the intersection of Hang Bac. Price tasty bowl of snails sold for 40,000 Dong depending on its type. GHE oc located at 15 Hang Luoc. These stalls selling snails and crabs. Open in the afternoon. The advantages of living in Hanoi is to always enjoy fresh seafood sold at the roadside. Various kinds of large marine animals such as shrimp, squid, crab, and a variety of shellfish can be enjoyed. All of this is usually eaten as a snack. Travelers are usually asked to choose what type of desired per kilo, and how to cook it. There are various ways of cooking, such as mussels steamed with ginger, grilled squid, crab meat sauteed with rice noodles, or already boiled in beer. Two famous street with lots of seafood merchants is To Tien Thanh and Duy Tan Tong. Some stalls on Tong Duy Tan is open from noon, but the evening is the best time to enjoy these foods. when accidental tourists compaction during the winter, they also provide seafood hotpot. In both the road most of the visitors are sitting on a bench at the edge of the road. In the winter, when the wind blows pierced the bone, tourists may choose to enjoy seafood in the restaurant closed despite having to pay higher prices. Here are some recommended seafood restaurants such as Thanh Hoa Restaurant is located at To Hien Thanh 4, Thu Trang Restaurant To Hien Thanh 12, 39 Hang Thung famous for spicy shellfish dishes, and Ha Noi Restaurant is famous for steamed shrimp, eel wrapped in leaves, and shrimp stir-fry. Vietnam Sandwich it called Banh My Pate or a sandwich relics of the colonial French. The bread used is a baguette or French bread. The most common fillings are cucumber, lettuce, pork, and spicy sauce. Another variation is Banh My Trung with leek stuffing, eggs, lettuce, cucumber, and spicy sauce. Some stalls are mnyediakan Sandwich Vietnamese Banh My Pate or as at 51 Hang Dieu is located in the corner Hang Non. They also provide a cake for dessert. Restaurant at 17 Ly Quoc Francis Su situated between Church St. Joseph and Pho Hang Gai. Vietnamese salad even fresher than western salad, with ingredients that are more unique and exotic. Materials commonly used for salads are lotus stalks, banana, papaya and young. Nom du du is easy papaya salad with sweet and sour flavor, spiked with dried beef. Restaurants that provide Vietnamese Salad is located 25 Ham Long Ngo Thi Nham between and Hang Ba. A plate of salad sold at around 10,000 Dong. The restaurant is open from 10.00. For you muslim travellers, do not worry to visit Hanoi. Because in this city you can still find a kosher restaurant. Here are some recommended Halal restaurants in Vietnam, like Quan An Ngon is located at 18 Phan Boi Chau, Hoan Kiem. Halal Retaurant located at 80 Giang Vo. Tandoor Restaurant is located at 24 Hang Be Street, Hoan Kiem. Nina Restaurant is located at 32 Hang Tre.